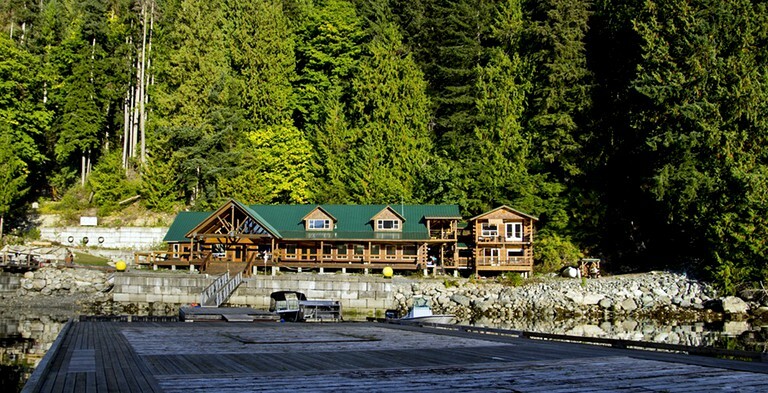 This all-inclusive suite is located on the Sunshine Coast, British Columbia, and can accommodate two guests. The suite offers an open floor plan with ample space and a private bathroom. Guests will find a queen-size bed or a double-size bed nestled against the wall, with stunning views of the sound available right from the bed. In the bathroom, there is a toilet, a sink, and a shower. Linens and towels are provided. Additionally, guests will find a wood-burning stove, a television, a sofa, and a cozy easy chair. There is also a delightful dining table, along with a smaller table near the window. 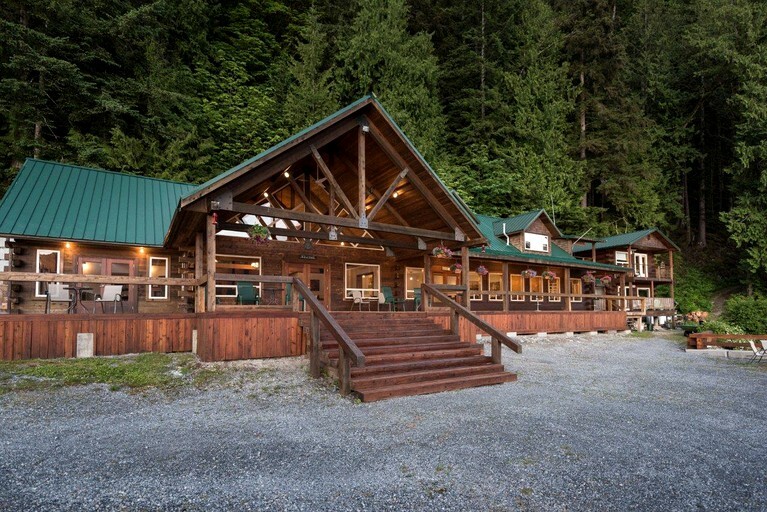 Guests of this amazing lodge will enjoy their provided meals with complimentary wine and beer. Wi-Fi is included. When staying here, glampers will enjoy the creature comforts of home while surrounded by the great outdoors. All guests meals are included during their stay and they should pass on any special dietary requirements. In addition, all house beverages are included. The property boasts Wi-Fi access, and guests are welcome to use the stand-up paddleboards and kayaks. 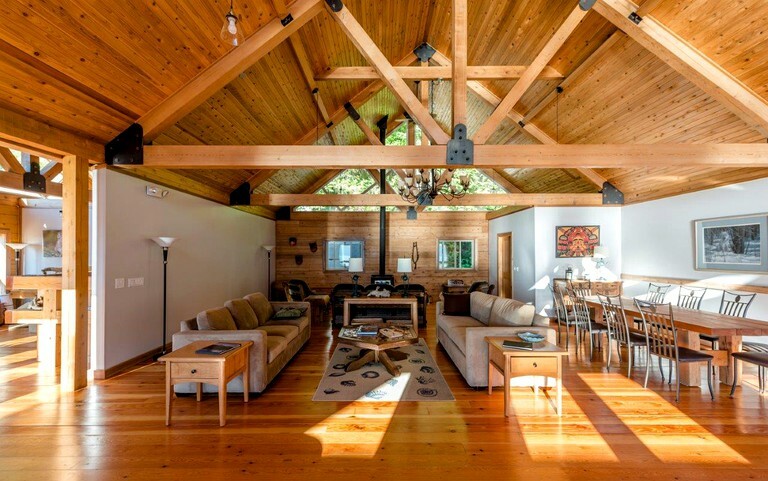 Additionally, the main lodge features a shared living area with a wood-burning fireplace, and along the ocean, there is an expansive dock that glampers can relax on after a day of exploring. 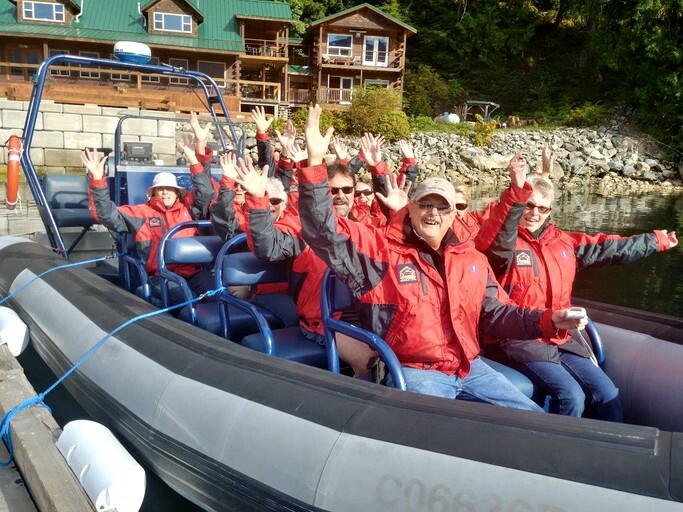 In addition to cruising on the way to the lodge, optional activities include grizzly bear viewing tours, kayaking, paddleboarding, and eco-boat tours. Cruise or land transfers to Lund Harbour or Powell River Airport are also included. The cruise from Lund departs once per day, with an extra airport transfer from Powell River Airport if required. This transfer must be scheduled at the time of booking. All guests meals are included during their stay and they should pass on any special dietary requirements. 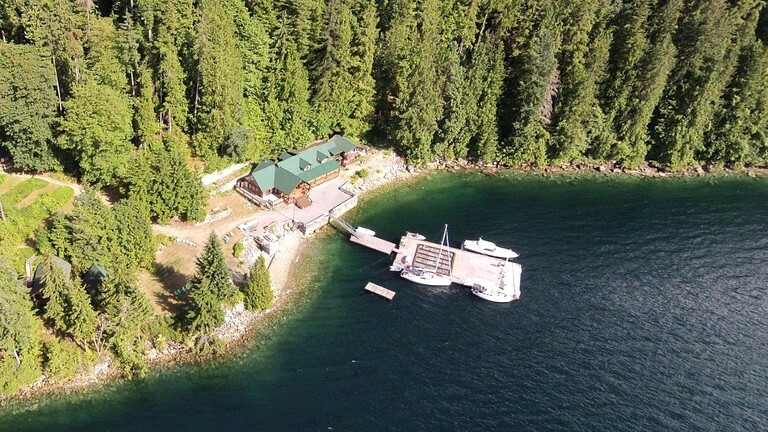 This secluded property is situated on the crystal-clear waters of Desolation Sound, a deep sound at the northern end of the Sunshine Coast, British Columbia, Canada. The area is known for its gorgeous wilderness, warm water, and unbeatable coastal and rainforest views. Stunning wildlife from marine animals to grizzly bears can be spotted. 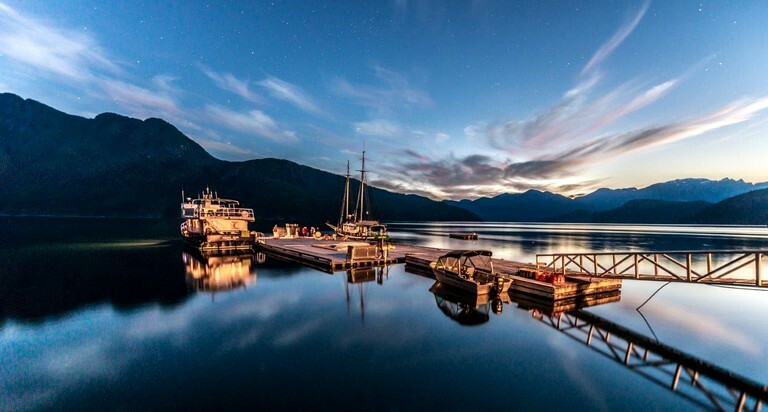 Though technically part of the British Columbia mainland, the Sunshine Coast has all the feel and laid-back attitude of island living. Secluded from the hustle and bustle of modern day life, the vibrant city of Vancouver is a mere 100 miles away. This accommodation offers a perfect location for glampers that love spending time by the water. The property boasts a dock from which glampers can cast a line or jump into the pristine water. 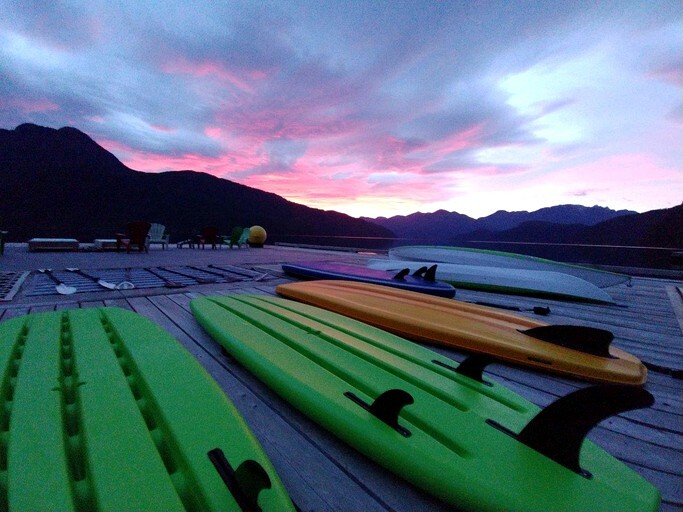 Kayaks and paddleboards are available for guests to explore Desolation Sound or float around during the summer days. The waters are warm here and perfect for an ocean swim or sit back and relax and watch the marine life from the large dock. There are two short nature trails that take guests for a short distance into the surrounded rugged coastal rain forest. One takes glampers uphill to the water source on the creek. The other trail follows the waterline to Foster Point where guests can view the Homfray Channel and view back towards the lodge. Both trails take about 15-30 minutes. If visitors need assistance, the host is always happy to help. Visitors can travel to the remote Toba Inlet, where a Klahoose First Nation guide will take them to view grizzly bears along Klite River. The bustling city of Vancouver is just 100 miles away and offers nightlife, restaurants, cafes, and other city attractions. Small dogs are permitted with an additional $50 a day. Parking is available in Lund at reasonable rates.